Discussion in 'RPG Maker MV School' started by Touchfuzzy, Sep 21, 2017. Ok, so here we go! Finally. The project is live. Right now, we have a base project. So you want to be involved! There are several things that need doing! We'll start with the things that still need to be done to make it a complete project, and then move down! To submit a title screen, post it in this thread with the first line as "Title Screen Submission" in bold, so I'm sure to see it! If you want to have yourself as a character in the game, you'll just need to submit a character in this thread! Characters will be added as the school expands. You can discuss submitted characters here. I want to make a lesson! This is the big one, and also the most time consuming to explain. Here is what you need to know to make a lesson. In person communication is always message, window, bottom. Messages that aren't people talking, such as just describing the scene (She is painting) are message, window, middle. Communications via the T.U.T.O.R. (explained below) are message, window, top, EXCEPT during event scans where it would get in the way. T.U.T.O.R. messages are always preempted by an alert sound that is specific to the teacher. Touchfuzzy's for instance is the Save sound effect. All lessons must be completely finished before another is started. (there will also be a way to back out of a lesson that resets it). Because of this we can reuse the same 20 variables and switches for each lesson. They just must be zeroed out at the end. In addition, each lesson will be assigned 1 additional switch, and 1 common event to do whatever they wish with. There is also a switch for when someone is on a lesson, so that it is easy to prevent them from starting other lessons. Lastly, there is a switch that is "ON" if The Student is male, and "OFF" if The Student is female, in case you wish to use that info. Self Switches should be used sparingly, due to how difficult they can be to reset. Exceptions are switches that turn themselves back off, such as the T.U.T.O.R. events. The T.U.T.O.R. (Thingamajig Used for Teaching Oblivious Rookies) is a device The Student receives during Orientation. 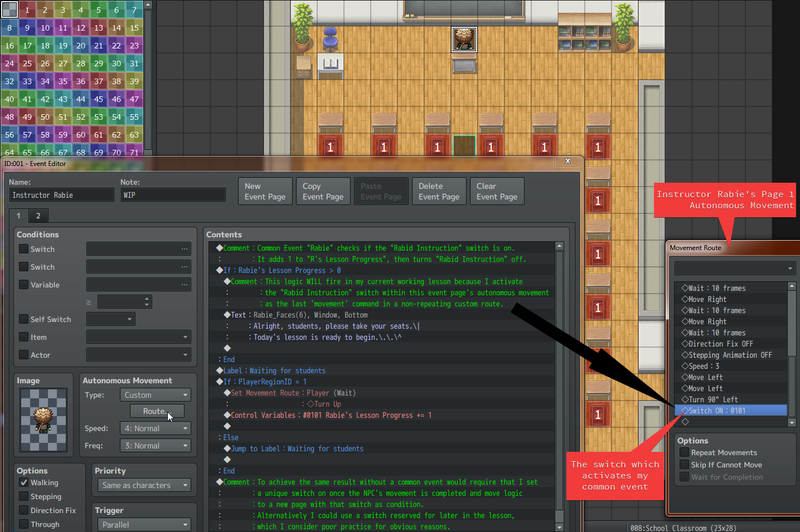 It allows teachers to communicate with the player no matter where they are, and also allows the user to scan events. It is easiest just to see this in action, so please just play through the orientation. To see the functionality of this and how to event it yourself, go to the basement and open the event in the upper left hand corner. Pages 3&4 are the T.U.T.O.R. functionality. More functions can be added later (I'm already planning a function that lets the user see the RegionIDs on the map), and if you have a new idea for a function for one of your lessons, tell me about it and we'll figure stuff out! We're good for you to add more of these. Try to keep Items to a minimum unless item use is the point of the lesson. Variables and Switches are a lot easier to integrate into the main project when we sew it all together. New NPCs, even non-community characters are fine when added during a lesson. (The orientation creates a villain NPC for instance). Let's aim for all of our lessons to have some bit of story. Story keeps the player involved! All the lessons that pass the quality check to get incorporated into the main project will also get some kind of prize! Also our favorite three will get to design the 2-4th floors of the school! There are a few bugs in the orientation. A few places where an alert sound isn't given when Touch communicates via the T.U.T.O.R. and the tutorial on how to use the device has a few wonky bits (it works though). I will be working on fixing those. Also, Credits will be added in game. I forgot to add the credits screen. (it will be posted on a bulletin board in the lobby). WolfKingAka, RocketKnight, CaptainRadish and 12 others like this. I'll submit a community character, member of the PVgames user club. do we build our lessons in the base project provided or do we make a demo in a new project but copy the switches from the base project over? Question about the first lesson with variables. but that doesn't solve it in game. What am I missing? The station to the left of the "crystal charger" (lol touchfuzzy your orientation story humor got to me) activates the 'charging' sequence, your numbers are indeed valid to 'charge' the crystal, you simply need to activate them via the left-side console in the basement to continue the tutorial. Might I humbly suggest the source code is shared open source on something like github: https://github.com/ in that way it will be easier for us to contribute new lessons using pull request mechanism. This sounds like a great idea and I would encourage everyone to participate, regardless of level of experience. The best way to learn something is by trying to teach it. Work permitting, I’d like to help with the classroom lessons. After a long hiatus, I am coming back to RPG Maker so this is a great opportunity for me to (re)learn-by-teaching. I work as an instructional developer and all the projects I have created in RPG Maker are edutainment/game-based training so this is something I have experience with. 1. A considerable portion of the community speak and read English as a second language (ESL). Create guidelines for dialog in the lessons to make them accessible to ESL community members. For example, avoid the use of idioms, slang, clichés and sarcasm (that is not identified as sarcasm, e.g., /s). Also avoid usin’ regional dialects and don’t do not use contractions. 2. Whenever possible, lessons should start with an example of what students will be able accomplish by the end of the lesson. This will help capture their attention and increase understanding as they see the lesson building to the final outcome. 3. Screenshots should have arrows or another method of highlighting the specific region of the screenshot being explained by the instructor. 5. Provide student feedback when they accomplish a task. When a student does something correct or incorrect, do not just provide encouragement or rewards. Also provide feedback on why they did, or did not, accomplish a task correctly. For example, in the MV School project demo, while charging the crystal if the student fails to set the power variable to 15 they are only told they were unsuccessful. Appropriate feedback would tell them the value of the power variable is X when it needs to be Y and brief reminder of how the charging stations work. 7. Create a list of all the lessons community members can sign up to work on. Try to get at least two people signed up to create content for each lesson. This will reduce the probability a lesson will not get completed when content developers drop out of the project. Alternatively, only have two or three active lesson projects at a time and allow all community members to drop in/out at will. 8. Create committees or teams of lesson reviewers, to include other lesson developers, and use standardized form(s) for feedback. Basically, put each lesson through a beta test and have beta testers report their feedback using a standardized form. Having other lesson developers participate helps make them better at testing and proofreading their work. This results in a positive feedback loop where lessons are increasingly polished when they are submitted. - The orientation for new students should become a true orientation. Layout what students will learn in the school and how the school is organized. It should end with a mind-blowing demo reel showcasing the kind of games they will be able to make after completing each chunk of training (aka school year) and upon graduation. - Each floor of the school should be devoted to a specific level of experience or ‘school year’. Floor 1 and the basement for ‘year 1’ Novices. Floor 2 for ‘year 2’ Beginners, etc. Additionally, all lessons and the project assets should be restricted to what that level the student would be able to use. This would prevent discouraging students by not exposing them to things they cannot achieve at their level of experience. It also helps gradually showcase the potential of RMMV as they grow in experience. For example, floor 1/year 1 maps and lessons should only use stock assets and plugins as much as possible. Floor 2/year 2 might introduce Resource Packs and maybe Core Engine plugins from plugin developers like Yanfly. Floor/Year 3 might introduce Core Engine add-ons, parallax mapping, and customizing tilesets. By the time students get to the top floor, RMMV is barely recognizable because there are almost no stock assets or plugins being used. As much as my workload will allow me, I would also like to create lessons or to help others create lessons for the school. I am currently learning MV and slowly recalling what I knew about VX Ace so I need to get back up to speed. I also created a Flash card game in VX Ace that includes some mini-games and a battle arena to make reviewing flashcards less boring. It also has a crude DLC management system that may spark some ideas for adding classes to the MV School project without having to republish the project for every new class. I would be willing to make it available to the project team to reverse engineer it (or turn the functionality into a MV plugin). The game was specifically developed for internal users at my company to review material for a bunch of old certification exams. I would rather not make it widely available without sanitizing it. I ran into a couple of things that could be improved in the next update of the demo project. - When the student is altering the switches in the basement to charge the crystal, feedback on the value of the power variable would be helpful. I missed the part about starting with a value of 5 so failed a couple of times. Then I tried to input a value in all 3 stations (like sarah_yt) and kept going over or under 15 but couldn’t see how far off I was. - The orientation doesn’t seem to end properly. After the principal told me I was done, I left the school…and ran into the principal who wanted to enroll me again and put me through character creation again. Then I broke the game because I was standing in the way of the event’s movement path when it tries to enter the school. Looking forward to seeing how the MV School develops and grows. Played through the demo, looking really nice so far! Passability issue on the windows though e.g. outside your classroom. 1) What's the deadline for submitting? I suppose it must be a way away, but I've heard talks of 'first round of participation' and am a little confused about what's actually going on I'm not familiar with any past RPG Maker community projects, so if this is based on some school made for a previous maker than a link with those original rules would be helpful. 2) I think that it'd be nice to have character names somewhere, else when you're talking to a community character you don't really have any way of identifying them. I know name boxes need a plugin, so my suggestion is just to have their name in a different colour on the first line of their dialogue perhaps? 3) I would quite like a common event if that's allowed. I think one that resets switches 1-20 and variables 1-20 back to defaults would also be useful to everyone making lessons. 4) Does the player have to be silent or can we write dialogue for them? 6) Second dragoonwys question. Also are we mapping to a theme of our choice or if the lesson is accepted will it get placed into it's own area/map? 7) I agree that a list of who's planning what would be nice. It'd be awful to work on something and realise someone else has been making the same lesson. Plus that way some lessons can be planned around the player already having acquired basic knowledge elsewhere. Rabie and starlight dream like this. @Rhino It's been said on the announcment that everything must be doable from within the editor, so no plugins. As for the character names, these are no problem. I could take care of them without plugins or any hassle, if necessary. It shouldn't be hard to add character names, but since Touchfuzzy is in charge of organising the project/adding NPCs I figured that suggestion would have to go through him in order to be updated to the main project. @Rhino Actually, since the code will probably be visible through T.U.T.O.R (if I understood it correctly), I think it would be better to refrain from any use of plugins. As for the names labels, I know Touch is in charge of that, that's why I only suggested I could make them. I have the base for the labels already finished, took me about 5 minutes in pixi. @Neuralsplyce I'd rather the project be written interesting rather than dry. This reminds me of a discussion I've had before about board game rule books. They shouldn't be written like technical writing. Technical writing is very very very very dry. It can be useful for reference but also very very boring. The goal of the MV School is to do everything conversationally, because hopefully we can entertain people and teach them at the same time. I'm not, and I don't expect anyone else either, going to leave conversational English. In fact if someone submitted a lesson that looked like technical writing I would straight up turn it down. It doesn't fit the tone of the project. Also, I don't want to do different floors for different levels of skill, because that prevents teachers from having consistent classrooms. Instead, lessons will be gated off based on other lessons that must be completed first. This both keeps people from hitting things they won't understand early, and lets lesson creators create a flow of story over multiple lessons. Also, this project will probably never go into anything with plugins, other than maybe installing them. The goal is to not to teach plugins, the reason being that plugins are 1. A Skill you will understand the more you use the rest of the editor anyway, 2. Teaching plugins from within the editor is just overly difficult and will really really cause the project to become unwieldy, 3. I straight up believe that, outside of coding itself, learning eventing is a more versatile skill than learning to use plugins, 4. Teaching anything beyond how to install and configure a plugin would require teaching individual plugins, of which there are... a lot, and the idea of picking out just a few to highlight seems meh to me. I also want people to just make what they are interested in. And I'll probably work on filling in gaps myself (I have a wide variety of knowledge in RPG Maker), so I'm not going to be writing up "this is what needs to be done" type deals. It is a community project that will intentionally grow based on what people feel like putting into it. I understand this might not be as structured as you would prefer, but I find people work better when they are using their own creativity. I fixed the error where I forgot to turn the switch on that indicates the orientation is finished. Sorry about that! I haven't uploaded the new version as it isn't really necessary to people making new lessons. Just add FinishedOrientation=ON to the end of the transfer event out of my office, page 4 of the events if you need it now. Feedback on the charging station is a good idea. I think giving anything beyond the final charge on the machine though is a bad idea. Just saying Charging: 14, Insufficient Charge. Or something like that. The reason is that they should then return to the T.U.T.O.R. scan to read through the events again, to make sure they understand it. The point of the T.U.T.O.R. is for it to explain the individual parts, but it is up to the student to put it all together to show he understands. Filename convention actually exists I just forgot to put it in the opening thread. Not for the added sprites/faces, but for pictures. Each teacher will have a 2 letter abbreviation (3 if we have to move to that based on a lot of teachers, if we get that I'll be happy), followed by the number of the lesson (as in, how many lessons that person has). All the lessons in the orientation are marked TF1 followed by a descriptive name. I just feel like the project isn't designed to be what you are expecting it to be. 1. Sorry! I forgot to add that First submissions are 3 weeks. So October 11th is the deadline. We'll continue to improve the project every month for as long as well.. for as long as I can think to. 3. Eh, resetting the two is like, 2 lines since you can select the ranges. That being said, Common Events CAN be used, especially if it is something that will be done a lot (I have the one I put in every project, that records player x, player y, player map, and the regionid of hte tile they are standing on) See my comment below to Rabie. 4. I had The Student (which is my official name for them) as a silent protagonist. I do sometimes write thoughts though in the middle set messages. Other characters do react to him/her as though s/he said something though. If you need someone asking questions, I would suggest having another student going through the class with him. 5. See 2. I'm not against using plugins, especially for quality of life, but the more we use things the player can't do with just the editor, the more it moves away from the point of the project. 6. Yes. Also, people can do "field trips" for their lessons and have the player leave from the front of the school to go to other locations entirely. Forgot to mention that. 7. I would suggest people do post what they are working on! I'll compile a list in the opening post, but as I said before, I'm not going to make a list of things that are "needed"
8. Definitely something to think about in the future. 9. Problem with this is that at this time, the only place where the T.U.T.O.R. button works is where it is evented on the map. Could be done with PageDown and common events though. Submissions should use the base project and build on top of it! @Poryg Well with the T.U.T.O.R. we mostly just show people what we want to show them since it is pictures. In fact there are some parts that aren't shown that exist in the orientation (for instance my character interjects in the middle of some of the events when you are doing them, but those messages are not shown in the T.U.T.O.R. scans. @Rabie The problem with this is that if it is called by a switch, that switch can't be used in any other lesson either. I think 1 additional switch and 1 common event though per lesson is not a terrible burden so I'm ok with it. Just use a switch outside the 1-20 Range. (PS I feel so very self-conscious about my level of uncommented eventing now ahaha). Also, if anyone ever runs into issues where their lesson needs more of something, an additional switch outside the reused ones, another common event, just ask me! In general, I'm not going to be super restrictive, but I need to know, so that we can try to make integration as easy as possible. Oh boy. I'm excited to take a look. I'm going to examine what's already in the project and how it's presented. I hope to write at least one tutorial for this project, but I need to see what's already been done and how I can add to it. Perhaps I could write an advanced course on variables? But I'm getting ahead of myself. @Touchfuzzy Thanks for clarifying everything! I really liked the orientation. The 'puzzle' involving the generator was pretty creative. Just a minor glitch, once the orientation is over the event outside restarts. Perhaps it should be tied to a different switch. That's about it for now. I really like this project's direction so far. Edit: Sorry, was working on this comment before I refreashed to page. I'll direct the comment complaint there. Not sure if this is the right thread for it but I wanted to point out that there's a mapping error. You can climb onto the walls by walking on the windows.